N.B. Before you keep reading, be informed that we no longer endorse Ladbrokes. We’ll adjust this review in due course, but till then, check out some of our favorite casinos here. 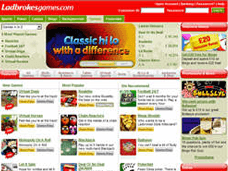 I consider big name sites like Ladbrokes to be the Wal-Mart of the online betting world. The group offers literally everything you can imagine when it comes to online gambling, including casino games, sportsbetting, bingo, and poker. You will literally find everything you want in one-stop, and that is a great thing. When it comes to Android betting and Ladbrokes though, there are questions as to whether or not the software is any good. 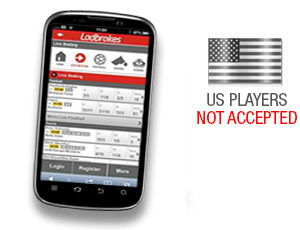 Does Ladbrokes’ mobile betting platform work well on Android devices? Read on to find out. Upon visiting Ladbrokes’ website on my HTC Butterfly, I greeted by a very friendly looking mobile casino page. Ladbrokes definitely does this right, and has a nice promotion up top, followed by direct links to the casino, sportsbetting, bingo, poker, and Live Casino portions of its site. This is a beautifully constructed Android betting site, with an emphasis being made on ease of use. I loved the fact that everything was available within two to three clicks on my smartphone. This is perhaps the best laid out mobile casino that I have ever played at. Registering an account on my phone was a very simple process that is made easier if you are using an auto-fill in browser such as Chrome. I had my registration completed within thirty seconds using that information, and punters who don’t will only take about two minutes or so. After getting myself all sorted out and logged into the website, I was ready to take a look at the bonus structure and make a deposit. Casino: Ladbrokes is offering a 100% match bonus up to £500. This bonus has a very decent 30x rollover and is available among the casino’s various slots. Sportsbook: Ladbrokes is offering £30 when you wager £10 on the site’s sportsbook. The way it works is this: place a £10 wager, and the book will credit you with the money after that first bet takes place. Bingo: Spend £10, get £20 free. Ladbrokes’ bingo section will offer an extra £20 when you spend £10 in their bingo section. 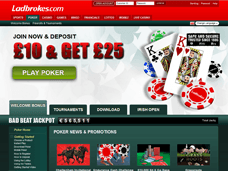 Poker: Ladbrokes Poker will give you £20 free when you deposit £10. The bonus is awarded out through eight tournament tickets. As you can see, a lot of these bonuses are very generous and have decent rollover or deposit requirements. You may not find anything outrageously good here, but you also won’t find anything that will gouge you on wagering requirements. This is a pretty solid bonus system that Ladbrokes puts on, and it is all available through your Android device. Ladbrokes accepts a wide variety of deposit options through their mobile casino. The options available for deposit include: Visa, MasterCard, Delta, Solo, Western Union, PayPal (unavailable for German players), Skrill, Neteller, UKash, and ClickandBuy. I ended up using my PayPal account to fund my Ladbrokes account, getting an instant withdrawal and transfer of funds over to the casino. The whole process was very smooth, and I am sure that the other methods operate just as smoothly. Ladbrokes’ Android Casino is possibly the best I have ever played. There are many games on offer here, and they all play absolutely brilliantly on my phone. There are any slots available in this mobile casino, with games from Net Entertainment leading the way. Some of the best slots available on the Ladbrokes Android casino include: Jack Hammer (with its awesome cascading slots), Starburst Touch and Zuma. Arcade games are also available, with the addictive Hi/Lo being complimented by the nerve wracking Deal or No Deal. While I am not a fan of arcade games generally, but these two games kept me playing for about a half hour, a real accomplishment if you know my aversion to such games. Table games are prevalent here as well, with all of your favorite games such as blackjack and roulette making an appearance. I really dig table games and found them to play extremely well on my smartphone. I never had an issue with a mis-hit of any buttons in game, and found every title I played to operate smoothly and never crash. The real crown gem of Ladbrokes’ Android Casino though, is its Live Casino. I love this section of the mobile casino, and feel that it is the future of online gambling. Live Dealer games feature a real dealer who is broadcast via webcam and allows you to make selections through your phone. The section is great, and I had a lot of fun playing mobile baccarat, blackjack, and roulette in this section. I definitely recommend you give this a go if you play here. Ladbrokes is well known for its sportsbook. The company was founded in 1886, and sportsbetting has always been the firm’s bread and butter. Ladbrokes’ mobile sportsbetting section is awesome, with a variety of great features making it a very capable betting platform while you are out and about. I ended up putting a £25 bet on Chelsea to beat Sunderland on my smartphone, and was pleased to know that I could follow the bet in the “in-play” section. The full array of sports is available for wagering on your device, and there really isn’t any drop off between the PC and Android version of Ladbrokes’ mobile site. My whole experience with the Android sportsbetting section of the site was positive, and I continue to make Ladbrokes my primary mobile sportsbetting site because of that. Withdrawing money from Ladbrokes is just about as easy as depositing. I was able to initiate the withdrawal process on my phone, requesting a PayPal payment from the group. I was happy to know that my payment was processed within a few hours, and I had the money sitting back in my account within a very reasonable amount of time. Besides PayPal, you can also use the following methods for withdrawal: Visa, MasterCard, Delta, Solo, Western Union, Skrill, Neteller, UKash, and ClickandBuy. Overall, I think that Ladbrokes is the best Android casino that I have ever played at. I love the fact that there is literally every type of online gambling that I like contained in Ladbrokes’ infrastructure. The games are fantastic, the sportsbetting is amazing, and the payment process is the best I have come across for a mobile casino. I literally can’t think of anything negative here. Ladbrokes is a fantastic mobile casino.